The knife that cuts through Worlds!! The Subtle Knife is the dazzling sequel to the Northern Lights. In this book we meet a new main character, Will. He stumbles upon a portal through to another world, where he meets Lyra and Pan, our courageous heroine from the Northern Lights, and her daemon. This book swaps between different perspectives of different characters, mostly only Will and Lyra but there a few others that have a say in this book. Lyra journey is not at a end when Roger dies, it is truly only beginning, with its focus on a type of matter called Dust (in Lyra's world). In this book Will obtains a knife that can cut a hole into another dimension. This knife has its advantages but with it come its disadvantages., they are hunted. Full of war, love, adventure, enemies and friends, this book is truly out of this world. Philip Pullman outdoes himself with The Subtle Knife. It is one of those books that definitely leaves you wanting more. You get introduced to a new character right away, a boy named Will. He's faced a lot of hardship, but he is one of those people that you love immediately. There is a lot of perspective changes in this book, but it's something that you really don't notice. Lyra is also in this book, and she stands her ground once again as one of the youngest, yet stronger female heroine's in book history. Her journey continues, but this one is to find the meaning of Dust, and to protect the life that she has loved for so long. You get to see a lot of old faces, and new faces, as well as new worlds. 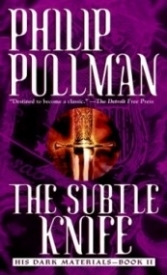 Pullman weaves an intricate story of comrades, love, hate, and adventure in the exciting second installment of His Dark Materials trilogy. The Adventure Continues for YA Readers Everywhere! Lyra is back again in this second installment of the "His Dark Materials" trilogy, but this time she is not alone! Will Parry, a young gentleman from one of the worlds beyond her own, kills a man (accidentally) as he is trying to escape the police raiding his house. What they are looking for, he can only guess.....but he has a sneaking suspicion it has something to do with his father's work which was eerily similar to that of Lyra's (newly revealed) father. This young pair set off on a fast paced adventure of traveling through worlds, discovering others that are looking into the Dust phenomenon, and escaping the clutches of those that seek to stop them on their quest. The cast of characters also grows to include Sir Charles who has been traveling between the worlds as well, playing both sides in this crucial game; Serafina Pekkala returns as she searches for Lyra and aids Lee Scornsby in his time of need; and two wayward angels, Balthamos and Baruch, who are waiting to take the young travelers to Lord Asriel, both the last and first place they wish to go. If you made it through the first book (congratulations!) in tact, I would definitely recommend continuing on as the story keeps getting better and better leading up to a most climatic end (at least until the final installment). Happy Reading! In the second book of His Dark Materials trilogy, we are introduced to Will who lives in our world. He lives with his mother (his father having disappeared on an expedition years ago) who others believe has mental issues. Will comes into posession of the Subtle Knife, which allows him to open and close "windows" to other worlds. He soon meets Lyra, and together they journey to discover more about dust. This second installment is also very entertaining and kept me hooked to the end. In this second book of the trilogy, Lyra meets Will, another boy who has found his way into the mysterious world between worlds. Together Will and Lyra gain control of The Subtle Knife, a magical artifact that can cut the barrier between worlds. Mrs. Coulter is still after Lyra, and the worlds are gearing up for a battle of magnificent proportions. Can Lyra and Will save the day before its too late? Although I liked the first book in this trilogy, this one didnt really do it for me. I mostly read it to find out what the ending was. And it ended in a cliffhanger, so I didnt even get that satisfaction. Although it is a fairly good book, do not read it if you dont plan to continue the series. Well, I wouldn't say these books have replaced any books on my shelves, but I sure hope to add them there as soon as possable! The Subtle Knife is the second installment in Phillip Pullman's His Dark Materials series. It is an excellent-No, fantastic-No! Outstanding continuation of the first book, The Golden Compass! You just can't put them down. I sure couldn't! I'm on the final book now, The Amber Spyglass, and it is awesome! Thrilling and mesmorisingly tastefull! I thought this book was pretty good. It's not as good as the first one though. I like Will a lot, he's a great character and he goes great with Lira. I love the situation in which he meets his dad. But the witch ruined it of course. The witches are great character too. Lyra has somehow left her world and now is in another world. During this time she meets Will who is a young boy from this other world who is a murderer. Because no one in this world has a daemon Lyra has to pretend than Pantaliomon is just a pet. When Will becomes in possesion of a magical knife which can cut through anything they sett out to leave the vengeful people whose brother wanted the knife and was then killed to due to his lack of it. This book is really good and all followeres of the His Dark Materials books will love it. I loved all three books, and couldn't put them down. I read them back to back in about 1 1/2 weeks. They're well written, suspencefull, intriguing, and heartfelt. Yes I wept, and even dare to say that these have replaced harry potter on my shelves.